Aren't these things lovely? My friend Tuva and I were walking around in Bergen the other day, and when we stumbled across this lovely photo opportunity, I told her to go in and make a phone call. 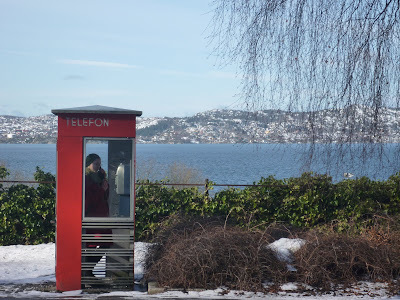 The Norwegian telephone booths were designed in 1933 by architect Georg Fredrik Fasting, who went to school and worked in Bergen. The number one challenge was to make them cheap, but they're also considered design relics, and the remaining 100 booths (there used to be 6000 of them, but the mobile phone made them more or less superfluous in the 90's) are to be preserved. Although a bit too simple for my taste, I can't quite resist the charm of this early modernist piece of everyday architecture. The view is more or less the same as the one from my school; these sweeping panoramas are an everyday thing for most people in Western Norway. The green stuff is ivy, a plant that in my opinion should be used extensively in temperate parts of the world, as they provide green stuff to look at in the winter, especially in urban environments. Imagine a grey winter street, only with ivy partly covering building façades, street trees, tall lampposts and roofs.